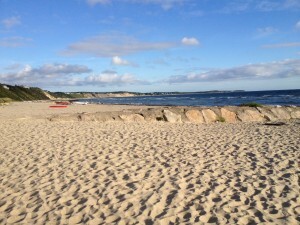 School may have started, but it is still technically summer till 9/21! 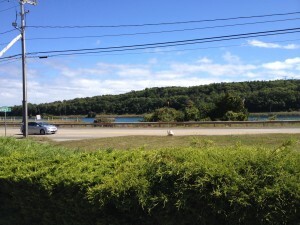 I rented a lovely house in Sagamore Beach and we spent the weekend, cooking, eating, drinking and playing games. I arrived first on Friday and had a few hours to myself before everyone got there. 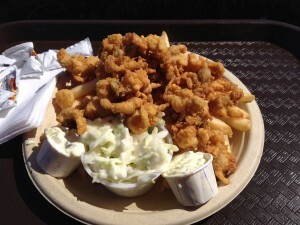 Since nothing says summer more than fried clams, I went in search of a platter. The Seafood Shanty is just that, a building on the side of the road with picnic tables to enjoy your food at and a view of the canal. I got the fried clam (with bellies) plate ($20). It came with a heap of indifferent fries, and cloyingly sweet coleslaw. But the clams were crispy, plump and briny and that's all the matters. The pizzas came quickly and were surprisingly good – far better than I expected random pizza to be. The crust was tender and flavorful and the mushrooms were fresh. I thought the white pizza was missing something (like tomato sauce and sausage/eggplant), but it was still good. Sorry, I didn't get a picture of the pizzas; we pounced on it and by the time I remembered, it was too late. 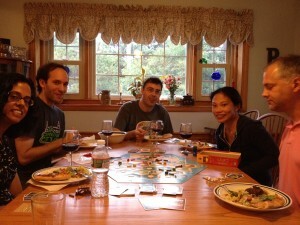 But here we are enjoying it, while playing Settlers of Catan.